Divine Urgency: Am I Who I Am? I have always been rather clear about who I am supposed to be. When I was all of four years old, I made three declarations about my future: I would become the Queen of Mexico, a nun who ran an orphanage, and a writer. My problem is not so much absorbing my callings from God—it is understanding what each call really means and being willing to consider alternate paths towards it. I've spent far too much energy berating myself for not following these calls to the tee—despite, for example, knowing full well that Mexico has no queen. match our own. We are—in fact—always becoming. I may never be the Queen of Mexico, but I spent years volunteering at a medical clinic in Tijuana. Though not a nun running an orphanage either, I was a Lutheran pastor whose family was initially formed through adoption—and who, not so incidentally, has advocated for adoption reform through the avenue of writing. I was delighted recently to learn from a placard at the San Diego Zoo that California Condors become more colorful with age. This was rather comforting to me. Though my paths to becoming who I am—to embracing God's plans for me—have wandered, one thing remains certain: Divine Urgency is not the same as human urgency. As long as we are becoming, we needn't fret so much about the specifics. The path, in and of itself, paints the full picture of who God calls us to be—and that picture becomes more colorful and closer to the Divine with every step. To read more stories from those friends of St. Andrew's who have heeded God's call, click here. 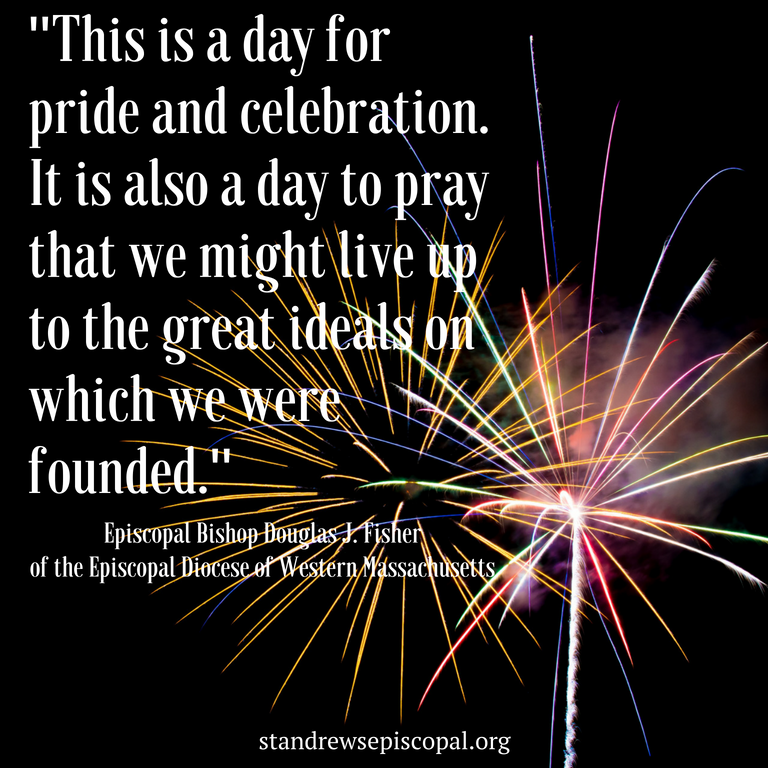 Douglas J. Fisher, Bishop of the Episcopal Diocese of Western Massachusetts, offered a poignant reflection on the 4th of July in a recent piece he wrote for telegram.com. We love our country. We are blessed and a blessing, and, in many ways, a beacon to the world. May we be good patriots and carry on a lover’s quarrel with America until we mend what has been torn apart. This is a day for pride and celebration. It is also a day to pray that we might live up to the great ideals on which we were founded." You can read Bishop Fisher's reflection in its entirety here. Every year at this time, blog posts and news reports appear begging mothers to consider all the people for whom Mother’s Day might not be a pleasant holiday. The growing trend is to request that mothers yield the day to those who have experienced loss. I wonder if it’s because Mother’s Day holds its roots in feminism. Early incarnations included ancient Greco-Roman celebrations of the mother Goddesses and a day for mothers of opposing sides during the Civil War to reconcile. The more formal holiday grew out of feminist calls to action, the most renowned being Julia Ward Howe’s late 19th century request for mothers to unite for world peace. It is indeed a helpful reminder that compassion and empathy for those who have experienced loss are two callings we should strive to fulfill. Must we do so, though, at the expense of celebrating the important values and lessons we learn from the women who came before us? This especially presents a challenge for communities of faith, who traditionally celebrate Mother's Day with gusto. I have been a motherless child. I spent over two decades estranged from my mother, who passed away just a few years after we re-united. I have also been a childless woman, desperate to enter motherhood. I spent years struggling with infertility and awaiting adoption. I understand how painful it can be around Mother’s Day to have images that evoke personal loss punctuate one’s time and space. I also know, though, how affirming it can feel to have our families, friends, and faith communities celebrate motherhood each year. Perhaps faith communities should think twice before eliminating a liturgical nod to Mother's Day. 1. Mothers in the U.S. are a marginalized population. It might not seem this way to people without children, who are tired of our double-strollers crowding sidewalks and our whining children disturbing their nights out (or to at least one woman who thinks that maternity leave should be available to women without children). However, U.S. mothers are regularly mommy-tracked in our careers. Unlike much of the world’s mothers and despite many of us requiring, at minimum, physical recovery time, we are not guaranteed pay for maternity leave. Child care is often prohibitively expensive for U.S. families, typically leading to one parent staying home. Since, on average, women are paid less than our male counterparts for the same jobs, it usually falls on women to sacrifice our careers if necessary to care for our children. 2. Father’s Day, the male equivalent to Mother’s Day, does not receive the same level of scrutiny and criticism. My Facebook feed isn’t filled each Father’s Day with calls to be more considerate of fatherless children and men who struggle with the loss of fatherhood. Father’s Day even holds the distinction of having been created largely so that fathers would feel included in celebrations of parenthood. 3. A day meant to celebrate women is the one secular holiday that U.S. Americans seem to want to micro-manage. There are various annual, secular holidays besides Father’s Day that celebrate a particular faction of people to the exclusion of others without the scrutiny held over Mother’s Day. When Veterans Day rolls around, those of us who are neither veterans nor closely connected with veterans step aside to allow the beneficiaries of the day to hold their spotlight. We even line up to participate in parades where we cheer on people we might not even know. Likewise, Valentine’s Day is typically considered for lovers, the crux of Halloween for children. Though we should never force pointed holidays onto those who don’t celebrate them, we can and do allow specific groups of people their special days. 4. The U.S. American calendar is filled with non-holiday events and experiences that provide opportunities for some to the exclusion of others. As long as exclusivity is not born out of bigotry, hatred, or support for inequality, this can be okay, even necessary. Non-runners, including those of us unable to run due to disabilities, typically do not begrudge runners their races, even though they close our roads and clog our neighborhood coffee shops several times a year. Adults don’t ask children to enjoy their school breaks less because we don’t receive the same amount of time off. We don’t request that college students avoid expressing their pride on social media about scholarships or other accolades they receive as academics, even though non-students don’t receive scholarships for general living. Everybody can’t be a part of everything, nor should we expect total inclusion. 5. More than any other group of people, it seems, mothers are constantly told how we are supposed to carry out our roles. We are given conflicting advice, backed by convincing, but also conflicting, science regularly. We are pandered to by corporations that want our money, criticized and prosecuted by legislators who want to control us, simultaneously demonized and deified by the media. Now we are being told to be careful about how we celebrate Mother’s Day because people who are not mothers, or who don’t have healthy relationships with their mothers or motherhood, might feel excluded. To be tossed into yet one more battle that divides and belittles us, a battle that few else are asked to enter with regards to other secular holidays, feels like another way to control women in general, mothers specifically. Within a contemporary feminist context, Mother’s Day affords us one day a year when we can hope for a neutral zone, when mothers can support and celebrate one another, despite our culture’s insistence upon dividing us. It also offers families who choose to celebrate the day together a formal pause in family chaos to reflect upon mother/child relationships. The concept of motherhood can be an emotionally loaded challenge for many people. I understand and have been there. I also believe that we can honor the losses surrounding mothers and motherhood within our culture while creating space on Mother’s Day for mothers and families of every incarnation to choose to celebrate motherhood as desired—inside and outside of faith communities—without fear of repercussion, guilt, and division. ​A version of this post was originally published at mommymeansit.com. A phrase I’ve been meditating on for a few weeks now is: “It’s easy to rush and make a mess, it’s hard to wait and give birth to a promise.” I’m someone who likes to see and get things done. I’m someone who has been too quick to answer, and too quick to move on in the face of frustration. There’s a word for that: impatient. I can be impatient about so many things in life, and I’m not the only one. When the shootings in Parkland, Florida rippled through the lives of the young people there, we all experienced some form of impatience. Wherever you stand on issues related to the second amendment and gun control, there’s impatience in the air. Something does need to be done, but what, and how? How do we resurrect dignity in the face of our own impatience? The young people of Parkland spoke. They used their voice to raise this impatience. In the space filled with sorrow and anger, they used the instrument God gives to prophets. How long, o Lord, how long? They restored their dignity by speaking to vulnerability and suffering. When I imagine impatience and waiting, I see a sort of dance. Impatience wants things done now, and waiting is okay — letting some pieces fall naturally into place. Neither is wrong, we should want things done quickly; and we need to learn to heel our expectations. All of this is wrapped in the most valuable resource we have: time. In our Greek scriptures in the New Testament, there are two words for time. Kronos (chronology) is sequential time: this happened then that happened. Kairos is opportune time: the time to act, decisive time. I’ll throw in one more Greek word for fun: kerygma. Kerygma is proclamation. For youth and young adults at St. Andrew’s and across the United States, we are in a moment of kairos. Our confirmation class is at an opportune time to practice their (kerygmatic) proclamation of faith. This summer, the youth group will participate in a kairos moment in fire swept areas of Northern California, proclaiming a Gospel truth of God’s wish to restore us and all of creation. With some help from my fellow young adults, we will embody a moment of kairos, seeking to serve people in our age group by studying our needs and understanding what needs kerygma amongst us. What we make of any kairos moment becomes kronos, a sequence of events, in the rearview mirror. But in this moment, we still need to listen for the Spirit, discern our call, and then act in prayer and hope. What Christians kerygmatically voice is the resurrection of dignity of all people through the life of Jesus Christ and the grace of God. We, as the body of Christ, are called to restore dignity wherever it lies in shambles, or simply needs restoring. With the example of the Parkland students in mind, may we speak boldly in this kairos moment, and may we proclaim the restoration of all people’s dignity. A feeling of self-assurance arising from one’s appreciation of one’s own abilities or qualities. A belief in one’s ability to succeed. But in reality, I have no idea. I have no idea if sales will close. I do not really know if our products will work for our customers. I have no idea as to whether we will meet our financial objectives. As I lay in bed at night or wander around the house I have my doubts. I pray for more self-confidence. I try to find it in books, seminars and articles. It has always proved to be short lived and ephemeral. On Ash Wednesday, as we in the church pondered both love and death, 17 children were killed — and many more wounded — in yet another school shooting. This time, the lives were lost in Parkland, Florida. It is natural to respond to such news by either fighting or fleeing. As a parent of three teenagers, I wanted nothing more than to hide the news from my children and go about our Valentine’s Day/Ash Wednesday events. Others jumped into argument mode, immediately debating the issues that arise when there is a mass shooting. There is a reason we hold a strong fight or flight response: it helps us to survive even the thought of such incomprehensible atrocities. What actions can we — as a community of faith — do to love more than we hurt? We can work to dismantle the hatred and bigotry that often lead to such violent acts. We can commit to nurturing those who feel overwhelmed by loneliness and isolation. We can work to effect the legislative changes necessary to reduce gun violence. We can create systems that assist those whose needs outweigh their resources. We can take steps to build strong, welcoming communities that embrace all people. We at St. Andrew’s express our prayers for and solidarity with all those affected by the school shooting in Parkland, Florida. We vow to take action to eliminate our own complicity in violence and to help heal a nation lost to grief. You can read the entire statement from Bishops United Against Gun Violence here and their more recent statement regarding school shootings here.